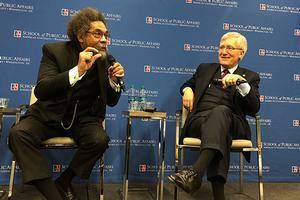 Scholars Cornel West and Robert George demonstrated that it’s possible to have a deep bond and mutual respect, even when you disagree on fundamental issues. Speaking at an event on campus Dec. 6 moderated by SPA Associate Professor Thomas Merrill, the two professors underscored the importance of engaging in civil dialogue and the value of a liberal education. “People don’t understand the ways in which love is so much deeper than politics,” said West, a professor of philosophy at Harvard University, known for his progressive views. He and George, a conservative legal scholar at Princeton University, have taught together for years and made appearances around the country promoting free speech. The scholars, who spoke of their friendship and referred to each other as “brother” throughout the evening, said building trust is crucial to having meaningful conversations. Otherwise, talking with someone with whom you disagree can feel like an assault. They each explained that if there is an understanding, it’s possible to engage and hold each other accountable. "Higher education can promote this dialogue," said George. "While college should prepare graduates for careers, the more important purpose is to provide students with an opportunity lead the examined life and be open to new ideas. To lead truly a human life in highest sense, means to be uncomfortable." The professors shared that students should allow themselves to be challenged. More than thinking a degree as a ticket to living large and being obsessed with status, West explained an education can cultivate a critical consciousness. West and George encouraged students to read writings from a variety of philosophers and get to know and become friends with people who have different perspectives and life experiences. At the event, SPA Dean Vicky Wilkins announced the creation of a new “Lincoln Scholars Program” next fall that will give freshman and sophomores the chance to learn with students from various political and religious backgrounds. Together they will build intellectual communities as they read a variety of books on political thought and philosophy and have small group conversations and retreats. The event was sponsored by SPA's Political Theory Institute, AU Kennedy Political Union, and College Republicans, Alpha Phi Alpha, and the Institute for Humane Studies. A complete recording of the event will be posted soon.